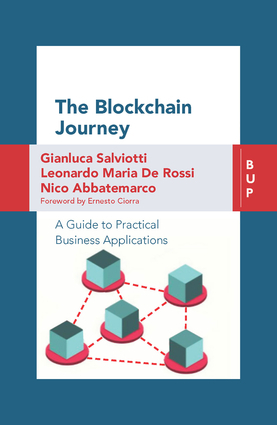 This book clearly shows which industries are the most impacted by blockchain technologies and provides several decision support tools for business executives. Managers in the most affected industries should no longer postpone the launch of blockchain-inspired initiatives, whether those initiatives are large implementations or pilot tests aimed at growing the maturity level on this technology. Once the decision is made to launch a project, other key options are related to what type of platform to implement, as well as on which consensus mechanism to rely on. The book provides a useful guide to addressing these decisions. On the other side, managers working in the less impacted industries might look at blockchain as a unique opportunity for innovation, pointing their attention toward some cross-industry applications. Nico Abbatemarco is a Research Associate of Practice on Information Systems and Digital Transformation at SDA Bocconi School of Management, where he is part of the core team for the Digital Enterprise Value and Organization lab. Leonardo Maria De Rossi is a Research Fellow at SDA Bocconi School of Management and contract lecturer at Bocconi University. Gianluca Salviotti is Associate Professor of Practice on Information Systems and Digital Transformation at SDA Bocconi School of Management where he is coordinator of the Digital Enterprise Value and Organization lab and Professor of Management Information Systems and Digital Transformation at the Executive MBA. In 2014, he won the Google Faculty Research Award with a study on small and medium enterprises' digitalization.